Bhindi / Okra stuffed gets cleaned off plates easily, around here. The stuffed okra recipe is simple, but time consuming because it's cooked on low heat. You can use store-bought masala to stuff the okra or home-made. Since I seldom buy store bought masala, I have something you can put together at home with out a branded sambar or chana masala powder. The key to making this dish is to make sure the stuffing is well cooked. Since the okra tends to brown easily it's challenging, however, cooking on low heat helps. Look who was visiting this morning! He is always around, digging holes in my planters. Notes: You can serve this dish with roti's or rice. 2. I added the cumin seeds with the powder and finished off with step 11 when I cooked today. slurrrrrrrrrp! tempting and mouth watering stuffed bhindi.I am just drooling. Nice clicks. Stuffed bhindi looks delicious. I love anything with okra. Bhindi Preparation looks so tasty and spicy. You have transformed a simple vegetable into a recipe fit for Royalty. Love your little visitor..so cute...stuffed okra is a indian classic ! Loved the addition of tomatoes! bharwan bhendi looks so delicious ...anything with okra is most welcome ...today i also posted one stuffed okra dish ..
Gorgeous space you have here! Glad I stumbled upon your blog. Your platter looks fantastic sunitha, especially the bright colour of the okra..love the idea of adding besan, would try ur version the next time. Love these, looks so tasty! 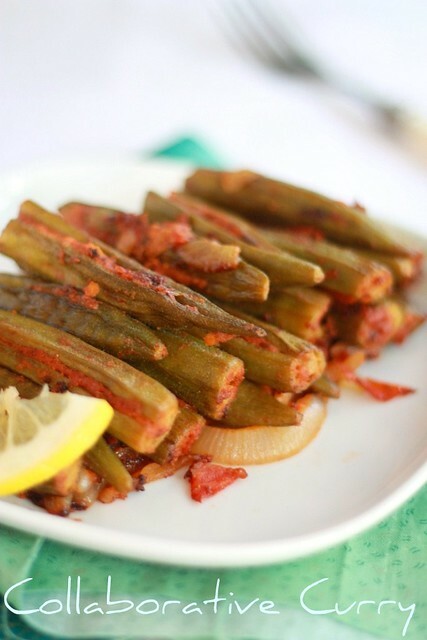 one of my favourite okra recipe but seldom make it. you tempted me with this lovely picture. very well made and utterly delicious. Beautiful clicks.Love okra any day.Awesome dish..
Nisha - Thanks for reminding me about aamchoor.. I did add it today but forgot to say that in the recipe.. I have added it on now. 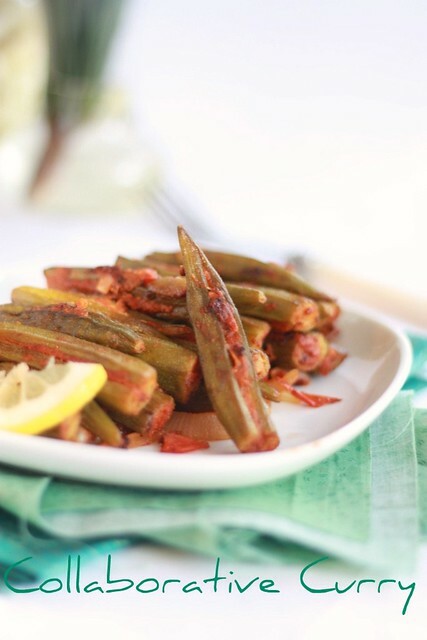 Spicy and delicious okra..looks so inviting and perfect. A very delicious looking okra! Okra looks colorful and delicious. Delicious stuffed okras..my fav too..pictures are mindblowing! I have been planning too post this for a long time. 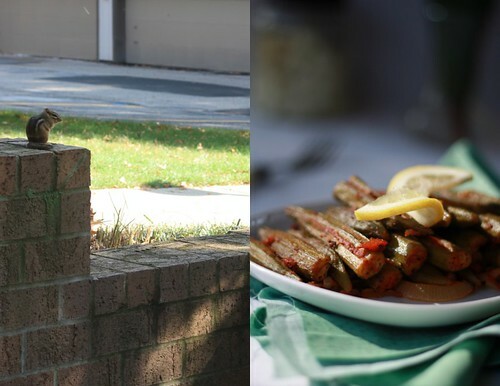 Super pics and a drool worthy stuffed okra. This sounds so delicious! I've never had orka before. Lovely presentation too. WOW!! Okra is one of my favorite veggie. This looks so very yummy..Love the tempting pics.. wow! !interesting bhindi fry...never tried dis way....yummy!! Stuff vegetables are always such a treat. These stuffed okra looks really tasty. yumm, love okra :) , by the way do you have any recipes that uses besan as the main ingrediant? we like to stuff fish paste in okra in my place here, your recipe is new to me, it sound so healthy and good. Do U use extra lighting while shooting? What a cute visitor you have! The capture is as if he is eyeing your bindis.I do somewhat similarly but it always gets one extra roasted crunch...I love it the way they look in your recipe! Droolworthy stuffed okras, very tempting..